Oscar 2013 predictions: Argo will win! We at Distrita are hoping for Argo. We have only good memories. It’s not a bad choice! 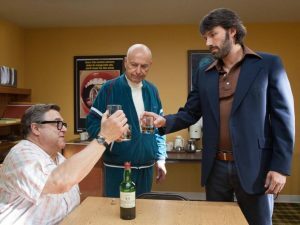 Thanks to Ben Affleck, Argo is a well produced movie, and it is extremely difficult not get feelings after watching this movie. It is easy to get a wet eye. It is a strong movie, that wants to tell us something. It is a deep, and with a point, a meaning, something we don’t find easily in the Hollywood blockbusters, so we appreciate a honest movie like Argo. And we are not alone thinking that Argo can win the Oscar for best screenplay this weekend. “Terrio’s screenplay deftly incorporated the lighter Hollywood elements into the movie’s thrilling rescue story. Nothing felt forced. And Ben Affleck will be the first to tell you that he simply shot Terrio’s script and tried not to mess it up. That said, it feels almost inconceivable that early-favorite Kushner won’t prevail. Outside of Daniel Day-Lewis’ lead turn as “Lincoln’s” title character, Kushner’s deeply researched writing was the most celebrated element of the movie. His screenplay brought the president and his times to life in a way that, aside from the beef of a certain Connecticut congressman, felt truly illuminating. But it likely can’t withstand “Argo’s” current momentum, which included a win for Terrio last weekend at the Writers Guild Awards. So good luck, Argo, Terrio and Affleck. Argo competes against “Beasts of the Southern Wild”, “Life of Pi”, “Lincoln” and “Silver Linings Playbook”.